I’m alive, well and still observing… I’m just not writing about it much. We’re halfway through the observing season and the weather in the UK hasn’t been helpful. I’ve still managed to clock some hours under the night sky, and I’m finding it useful to keep a record. 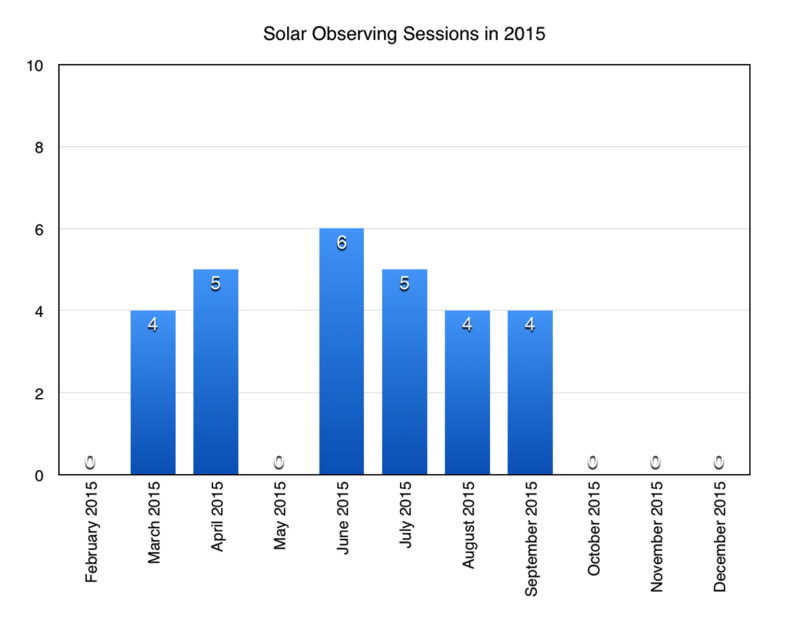 Keeping track of observing data. 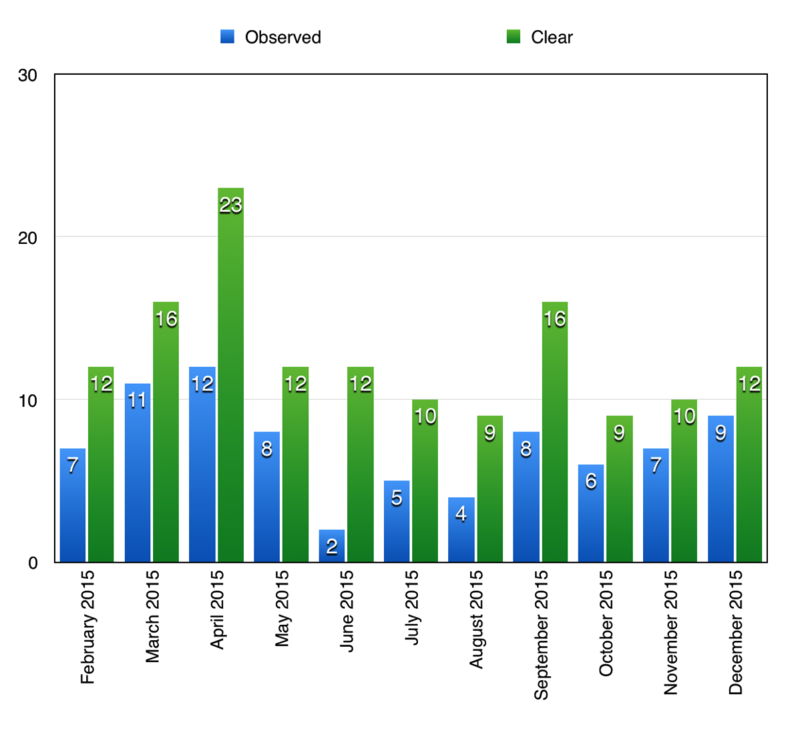 In February last year I decided to start keeping track of my observing activities and the weather that sometimes kept me from doing so. At the end of the year I added up the totals and here they are. I should mention that my definition of clear is pretty generous. If there’s a half hour spell between the clouds, that’s a clear night; if it’s cloudy enough to make the constellations hard to see, but the Moon is about, it’s clear. On the other hand, there will be times when it’s been clear but I haven’t noticed it. I have to admit that I don’t constantly watch the weather outside for a chance, and I do sleep too. So caveat aside, what does this tell me? Firstly it tells me that I took 77% of the opportunities to observe that the weather chose to present me. It was a good start to the year, in fact so good that it enabled me to work out that other activities enforce a practical observing limit somewhere in the mid-teens. I’ve not been too far from that at times, which I’m satisfied with, and considering my other obligations and a couple of prolonged bouts of illness it’s been a good year overall. Unfortunately, the observing cliff in the middle of the year was partially due to the aforementioned illnesses, but more particularly two issues of orbital mechanics. 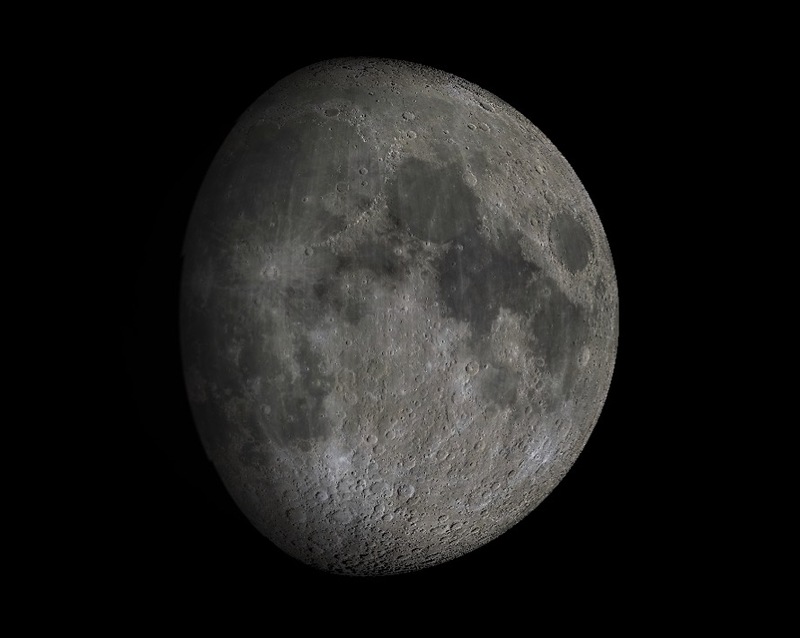 The first is that it doesn’t get properly dark until nearly midnight around the summer solstice, and only stays that way for a couple of hours. It never reaches astronomical darkness at that time of year, so some objects are very tricky for the analogue observer without GoTo as signposts can be few and far between. 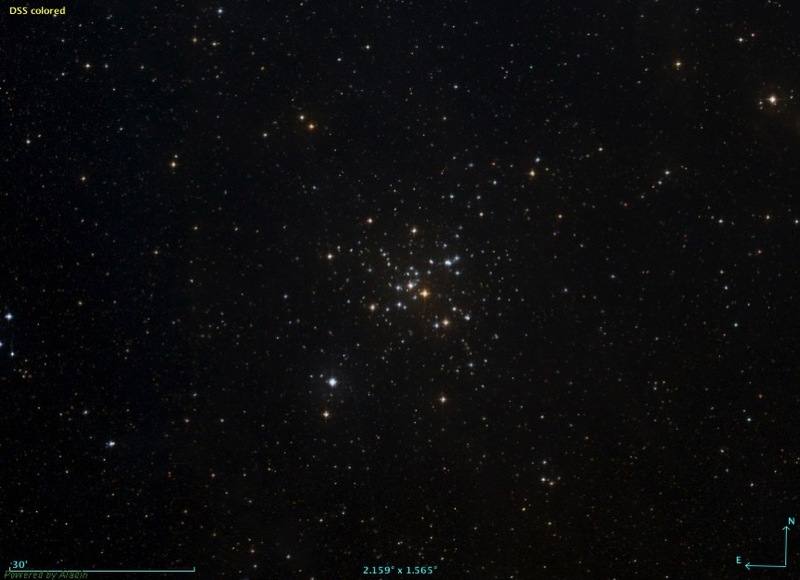 There are many of my deep-sky friends that completely close down for the summer: kind of inverse hibernation. That said the skies weren’t bad. I experienced some lovely transparency and managed to find the Veil and North American Nebulae for the first time with a little help from my new Astronomik UHC filter. Little did I know that I’d come to miss those skies. And then the solar system picks on me in particular because I do almost all of my observing from home, I don’t own a car, and I don’t like driving much anyway. Having found joy in lunar observing early last year I discovered that the Moon never strays high enough in the summer to be visible over the top of the houses from my garden. The planets are rather low in the ecliptic at the moment too, and intend to stay that way for a few years! 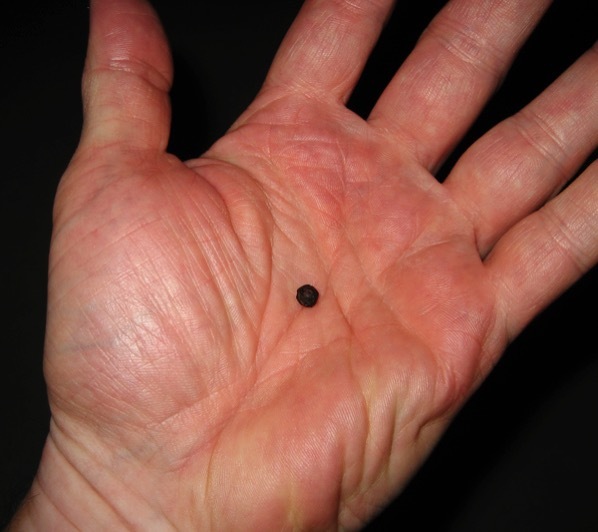 I couldn’t see Saturn from my garden at all… which was upsetting. I wasn’t pleased, but the Universe didn’t seem to care about that much, so I’ve had to make different plans. It did reduce the options to fill observing time in those bright summer evenings though. My ST-80 on a photo-tripod provides a grab-and-go facility, but it’s not ideal for either planetary nor lunar observing. In an attempt to remedy this problem I’ve resorted to retail therapy and bought a Celestron C90 in the hope that greater mobility will help in 2016. I like this scope already: it’s compact and as easy to mount as the ST-80. So what did I do instead? 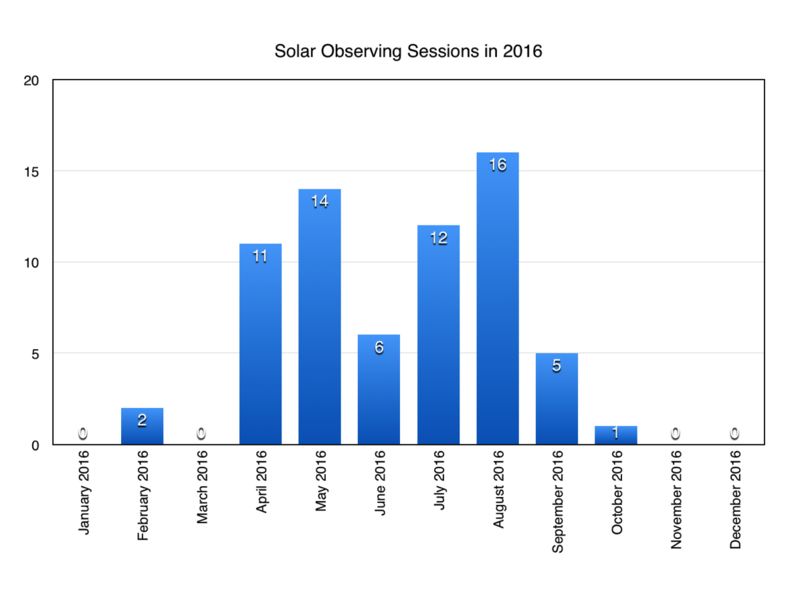 I found that the Sun puts in more of an appearance as the Moon plays hard to get, which is shown in by the number of solar sessions below. These seasons pick up the slack nicely and mean I don’t have to wait for it to get dark. I intend to do more white light and hydrogen alpha observing, and sketching, in 2016. Oh, and more nebulae too. They’re addictive. Don’t worry, the dark nights are on their way I thought. Frankly what constituted a clear night in autumn (fall) 2015 had to be very broadminded. We’ve had unusually warm and wet weather from the south-west which has produced the night time temperatures of summer, which never seem to happen in summer! It’s also brought lots of cloud. What’s worse is that the moisture in the air has made even cloudless nights appear milky: washing out most deep-sky objects and many constellations. I was pleased to see the return of the Moon this winter, since the poor transparency has frequency made it the only game in town. On occasion the Seeing has been a compensation: there have been really good spells. This has been perfect for observing lunar and double stars with a small refractor, which I do as much as possible. Winter has yet to arrive at the time of writing, but the next few weeks look hopeful: forecast is for it to get cold and clear. I hope they’re right. 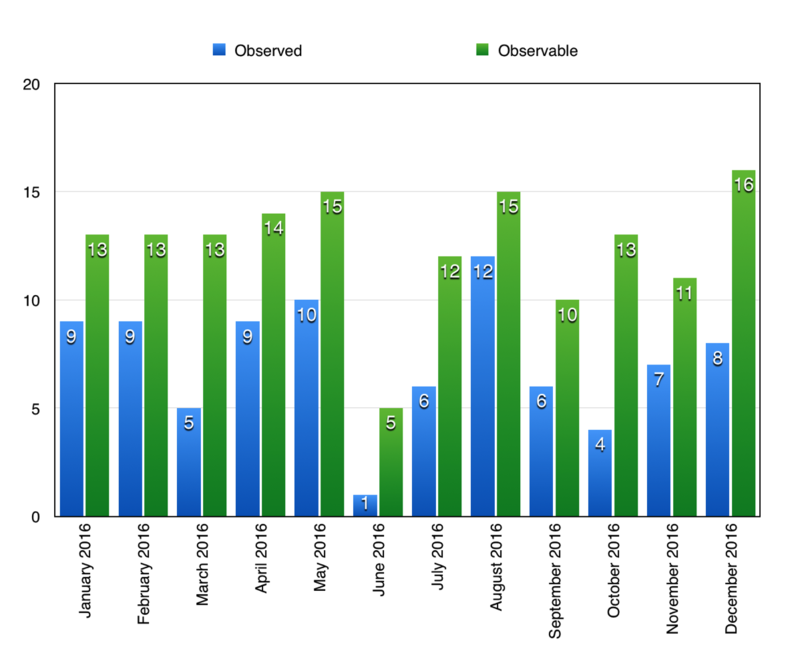 Tracking my observing through the last year’s varying conditions has caused me to consider my choice of equipment more carefully, and perhaps more importantly, diversify my observing goals. I’ve been asking myself, what gets me out there? It’s one of those times that I’m glad I don’t own a big scope. My small scopes, with their rapid cooling time, can be in action in a few minutes without the need for an observatory. Perfect for the conditions I’ve been experiencing. I’ve decided to stick with them, so the 10–14 inch dobsonian mounted scope is shelved for the moment, since many of my autumn sessions have been a sequence of half hours between rain showers. It’s an interesting challenge to see what you can do with limited aperture. I expect 2016 to contain much more lunar and solar sketching, the former for the winter and the latter in the summer. 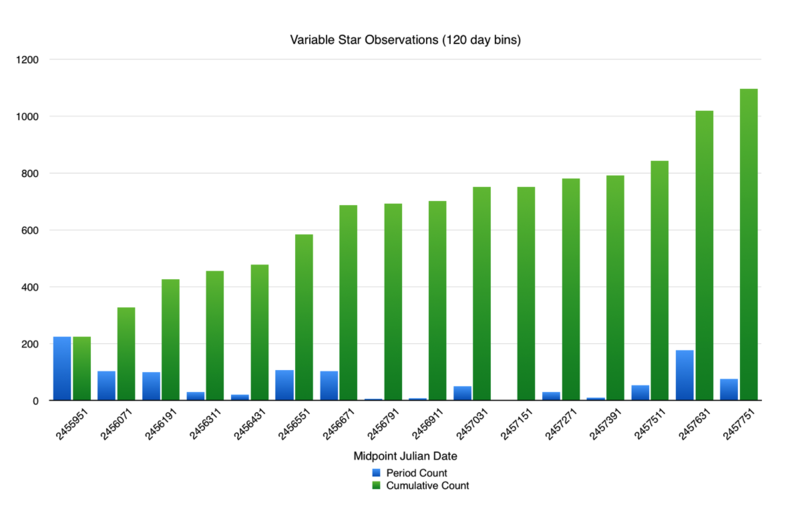 Double and variable star observing remains unchanged because I love it. The biggest change is that in addition to open clusters I’ve become obsessed with planetary nebulae. They’re an interesting test of your observing skills and many are accessible to small scopes from light polluted locations.